Today is Valentine's Day in the United States and some other parts of the world. Some people love Valentine's Day, other people hate it, some people are indifferent to it; for other people it can be a difficult day, for myriad reasons. On days like this one, when everyone is implicitly obliged to celebrate feeling a certain way, to not feel that way can be alienating. It can leave one feeling unseen. Which is an awful way to feel. No matter how you feel about the day, it's valid. 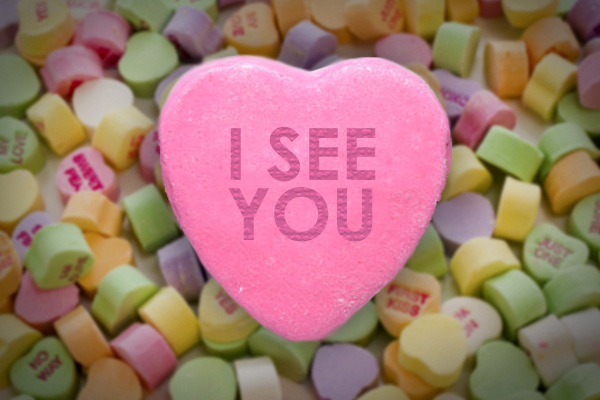 And whether you are feeling good, bad, or indifferent, I made a candy heart for you. True on this day, and every other. Labels: community, I see you.